What we call retro style today was first popular in the 50s. Then it was known as Contemporary. It was modern, light and stylish furniture far removed from the fussy, traditional styles popular in the 20s and 30s. Contemporary was also different from the Utility furniture made during the war years. Utility was modern and functional; Contemporary was modern and fun. Utility furniture was made during the war years to help newly weds, families whose homes had been destroyed by the bombing and others in desperate need for furniture that was no longer being produced. After the War, shortages meant that the Government continued with the Utility scheme until 1952. Originally Utility furniture was made to designs controlled by the Board of Trade. Utility furniture was good, modern design. Some of the pieces looked plain and institutional, but the majority of it was simple and elegant. Utility was also significantly better than furniture most people could have bought before the War. However, people tired of Utility. They reacted badly to being told what kind of furniture they should buy. Retailers were tired of Utility designs and wanted something different. In 1950 manufacturers had a chance to show that they could do better than the Board of Trade when they were able to make their own designs to sell under the Utility brand. Initially, though, they returned to their tried and tested pre-war designs. Retailers had a prejudice against modern design. They saw customers' reactions to Utility and thought modern furniture was difficult to sell. The problem with Utility was that everyone had the same furniture. There was no status to be gained by owning a piece of Utility furniture. Few people wanted exactly the same furniture as their neighbour and if they had done a bit better than the average man, they wanted to reflect this in style of their homes. However, by the early 50s there was a small, but growing, market amongst those with money to spend on good quality, modern furniture. Pioneers of modern furniture before the War returned to making their own designs once they were allowed to do so. Gordon Russell's firm returned to producing exclusive designs for a well-educated market. Retailers such as Heals and Harrods catered for the top end of the market. They took only the very best in contemporary design. There were beautifully detailed modern sideboards, with abstract patterns cut into the veneer to reveal a different wood beneath. Chairs were simple and elegant, upholstered furniture, often heavy and overstuffed, was light and sculpturally organic in appearance. Although its roots were in the functionality of the Bauhaus, the new furniture was entirely different in appearance. These makers catered for only a very small section of the market. Prices were prohibitive for most, even if they liked the designs, which were still too severe and functional for the majority of the public. 'Contemporary' emerged as the buzz-word to describe modern furniture of the fifties. The furniture trade did not like it and there was some debate as to an alternative. 'Mid-century' was one suggestion or 'Neo Elizabethan' after the Queen's Coronation in 1953. However, Contemporary was the word that stuck with the public. The furniture chain stores of the day refused to take modern furniture, however, small, independent retailers were more receptive. For a short period low priced, well-designed Contemporary furniture was available, if people were prepared to go outside their normal buying patterns to get it. This market though, was tiny. At this time, a few of the medium sized manufacturers saw that a market for Contemporary furniture was developing. Some started to experiment with contemporary designs. The influence from Scandinavia and particularly from Sweden, was strong. These firms often made a small number of contemporary pieces alongside their traditional ranges. One firm sold five hundred semi-reproduction fireside chairs per week, but took eight months to sell the same number of modern chairs. Even some of the larger furniture makers experimented with contemporary design. Harris Lebus produced some contemporary models as early as 1951, it was though a tiny proportion of the firm's output. Another of the larger firms, F Austin, which mass produced Austinsuite bedroom suites, made a contemporary suite in 1951 and A H McInstosh & Co Ltd of Kirkcaldy, Scotland, introduced a new bedroom suite in burr elm in 1951. The traditional ranges kept these firms in business, but a small, steadily growing, modern range was now economically viable; these were sold mainly to the department stores. A new section of the furniture-buying public now existed who were not happy with old-fashioned designs. Public appreciation of modern design of all sorts had a huge boost in 1951 when the Festival of Britain opened. Britain was still in the grip of post-war austerity. Rationing in the early post-war years was more severe than in wartime and the public could only dream about the consumer goods intended for the export market. Although the Government ended petrol rationing in 1950, it reduced the meat ration to below the 1945 allowance after a dispute with Argentina. When King George VI officially opened the Festival of Britain on 3 May 1951, it was a bright beacon of light, which promised a much better future. For the eight million people who visited the exhibition it was a dream world, very different from everyday life. The buildings were amazing compared to the drab world of post-war Britain. The Festival Hall, the Dome of Discovery and the Skylon were a celebration of early fifties' style, not the seriousness of the pre-war modernism, but colourful and playful. Some wit claimed that the Skylon, a narrow, brightly lit icicle suspended on wires, was a metaphor for the British economy: slender with no visible means of support. The Festival was a great marketing exercise for modern design. The exhibits were hand picked by the Council for Industrial Design. The significance of the Festival was not lost on Gordon Russell, who by then was the Director of the Council for Industrial Design. He wrote the introduction to the guide booklet, "Design at the Festival". In it he said that the very best of British design was on show, not just exclusive hand-made items, but mass-produced products as well. "Design at the Festival" included a section about furniture. There were some typical room layouts displayed: a living room, dining room; a bed-sitting room for a bachelor girl, a bedroom and a childrens room. The furniture was the very best of contemporary style on offer at the time. Designs were by well-known figures, such as Earnest Race, R D Russell and Robin Day. Adapting a design for a chair for the Festival of Britain, Robin Day designed the Hillestak chair for Hille in 1952. Although the chair was suited to large halls, where its stacking capabilities were useful, Hille also displayed it in home setting with a matching dining table and sideboard. The dining suite qualified for relief from purchase tax and sold at below the standard price. It was not, however, a big seller with the public. Even the Cabinet Maker, which praised the design, described it as "austere". Perhaps it was too austere for many. A look for Contemporary furniture evolved; it was light in colour and feel. Splayed, tapering legs made tables, chairs and even heavy items, like sideboards and wardrobes, float off the ground. These modern items had no applied decoration. Simple, wooden handles sufficed. The accent was on functionality and comfort. Light oak was the favourite material. Previously designers had favoured mid or even dark oak. It was a new age and people no longer wanted dark furniture. These simple pieces furnished rooms decorated with brightly coloured abstract wallpaper and curtains. Set against the pre-war taste for brown and beige, they would have looked dull, but with the new background they looked bright and modern. Contemporary was Utility with attitude. The mid fifties was still a transitional period for furniture design. Although Contemporary furniture was increasingly popular with the public, there was still a strong market for reproduction antique and traditional furniture. 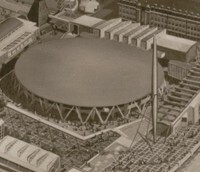 An exhibition staged by the Design and Industries Association at Charing Cross Underground Station in March 1953 showed that people were beginning to like Contemporary. In the exhibition there were two rooms, one furnished in the best selling traditional furniture of the day and another in contemporary style. Visitors registered an opinion as to which they preferred; 60% chose the contemporary room. The BBC generated further interest in Contemporary furniture when Joan Gilbert chose a modern look for the setting of the fortnightly chat show "Joan Gilberts Diary". Hille supplied some of the furniture. They saw this as an important marketing opportunity and instructed retailers on how to display a mini version of the set in shops and to answer questions from customers about the set. G-Plan, launched in 1952, was the real catalyst that changed peoples minds about Contemporary furniture. G-Plan made modern design both accessible and desirable for the majority of the population. In the second half of the fifties, Contemporary was firmly established, but the simplicity of the original idea transformed into something more glamorous. Life for the majority of the population was getting better. Britain had a head start over her European competitors who had lost more in the War. British industry was back to full strength by the middle of the fifties and the economy was booming. In an upbeat speech in 1957 the Prime Minister, Harold Macmillan claimed, "most of our people have never had it so good". This one phrase, quoted out of context, it was a warning about inflation, captured the mood of the late fifties. One statistic that summed up the change from affluence to austerity was the growth of television ownership. In 1950, television was the preserve of a wealthy minority, in 1960 three-quarters of the population had access to a television set. Other consumer products, such as radios, vacuum cleaners, washing machines, 'fridges and record players were becoming necessities rather than luxuries for the majority of the population. Car ownership too reached unprecedented levels. The furniture industry had a tough time competing with all these new and exciting products for peoples' hard-earned cash. It was essentially a fashion industry. There were technical advances, but they did not change the basic function of most peoples' furniture. In the world of electronics, transistors replaced valves, television sets improved rapidly and when ITV went on air, people had to have sets converted or pay for new ones. There were changes in the design of electrical goods, but they were of secondary importance to technical developments. Furniture design went through a radical transformation from 1955 to 1960. The previous emphasis on lightness and light or natural oak disappeared. The look of the late fifties was one of unashamed glamour. What made people buy was an image of a better lifestyle. The advertisements of the time depicted a glamorous setting with new, fashionable furniture; they hinted at a sophisticated lifestyle of dinner parties and cocktail evenings. Ladies wore the latest fashions and men always had a sharp suit. Often a drink before dinner was the scene, or sometimes the meal itself and on other occasions, the brandy consumed afterwards from an extra large, balloon glass completed the picture. This was not the norm for the majority, but the adverts promised people this lifestyle, if they had the latest trend in furniture. There is a strong parallel with the automotive industry. For the first half of the fifties, austere post-war fashions were an evolution from pre-war designs. Gentle curves and subdued greys were popular. In the second half of the fifties, American glamour in the shape of pointed fins, brash chrome and brightly coloured two-tone paint jobs adorned most British cars. It was a time of excess. Some of the products of the most prosperous years of the sixties, such as the Vauxhall Victor, failed to last well. In furniture, the glamour of the late fifties inspired a change of woods. Exotic African mahogany replaced the light and natural oaks of the early Contemporary. The trade and advertisements of the time called this wood Tola. It had a much darker, more luxurious feel. Finishes were once again shiny. Chairs were finished in black and other furniture had black ebonised legs. The brown and black finish was even described as two-tone in the advertising copy, echoing the two-tone paint of late fifties' cars. Shiny brass handles completed the look, which G-Plan sourced from automotive suppliers. Sideboards grew in length, sometimes to even greater than seven feet. You needed a big house to accommodate one of these. The influence may have been early adoption of the Scandinavian fashion for long, low, coffin-type sideboards, it also may have been a development influenced by the US. The tone for the 60s was already set by the end of the 50s. Scandinavia once again provided the influence. Danish furniture in hand-oiled teak was already popular in middle class homes. A few UK manufacturers started to experiment with teak. A H McIntosh was one of the first of the mass market manufacturers to adopt teak. By the middle of the 60s, the Scandinavian look in teak was the most popular style.